Click "+" in a group chat conversation and select "Live Chat". An invitation message will be sent to the group chat's members automatically. Hold the button in the middle. Talk after the tone when the indicator light turns green. Members in the Live Chat will hear you immediately. Only one person can talk at a time. The indicator light will turn red if you press the button while others are speaking, and you won't be able to talk. Open a group chat conversation and click at the top right corner. Select "Group Chat QR Code". Select "…" at the top right corner. You can share the group chat QR code via email or save it to your device. People can scan the QR code with WeChat to join this group chat. 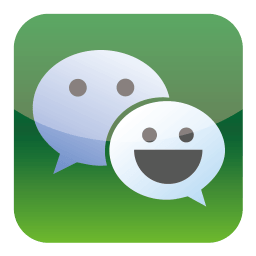 Video Call is available on WeChat versions 4.2 and later, allowing you to talk to your friends face to face. In the chat window, press "+" and select "Video Call". If your friend has not sent you a message in the past 10 minutes, you need to send them an invite message and get a response in order to call them. Select "Video Call" again in the chat window. Your friend will see the following window and can tap Accept to start. You can switch between Video and Audio modes during the call. Added Direct Download link which contains the .apk file for Android devices.